On any Premiership match day in pubs and homes around the UK, football fans of all creeds gather to drink, socialise and cheer on their favoured club. The majority of teams have a strictly local following, while others - generally the most successful sides like Manchester United, Arsenal, Liverpool and Chelsea - possess a nationwide army of devout supporters. In recent years, these leading British teams, as well as equivalents from premier leagues across Europe, have transcended national boundaries, evolving into powerful and prominent global brands. Manchester United, Real Madrid and AC Milan, to give three potent examples, are more franchises than football clubs. Sir Alex Ferguson's side is believed to have a staggering 300 million fans worldwide - that's five percent of the earth's population. Russia is no exception to this rising trend. Walking into Moscow's aptly-named Bobby Dazzler sports bar on Champions League semi-final night last season, one could be easily forgiven for thinking they'd just entered any of London or Manchester's innumerable drinking dens. Irish pub food is on the menu, with a selection of beers including London Pride, Carling and Guinness. A large group of red-devilled shirts is clustered around a projector screen, chanting, shouting and applauding as their 11 heroes defeat rivals Arsenal 3-1. When the final whistle blows, the room erupts into song - the `Moscow Reds' are celebrating in style. According to Ilya Zubko, deputy sport editor of the Rossiyskaya Gazeta national newspaper, English football started getting popular in the early 1990s. "Russian TV stations were broadcasting league and cup matches, and fans got to experience a different kind of atmosphere, a different kind of football," he explains. "Those people with money began to travel to the UK and see it for themselves, so our country's supporter culture became slowly more influenced by English habits. In fact, they didn't only visit the matches of popular teams, often choosing to watch smaller clubs to experience the real atmosphere for less money. Supporting an English club is a kind of fashion now." Lifelong Arsenal fan Alexander Krotov, who heads the club's official Moscow supporters' group, says he was drawn by pure quality of football: "I was about 10 when I started watching Premier League games on TV. It became much more interesting for me than Russian matches - I just loved the way Arsenal played. When I compared that to Russian teams, it was like they weren't from the same planet." Arsenal manager Arsene Wenger's acquisition of playmaker Andrey Arshavin in January this year has increased interest in the club, although perhaps not to the same extent as the boom of Russian support for Chelsea after oligarch Roman Abramovich's takeover in 2003. "More people come to watch Arsenal matches with us now," says Krotov, "But once Arshavin is substituted, they all walk out." You won't find any of this fickle mentality at the Bobby Dazzler, however, where the Moscow Reds wail out chants they have clearly spent some time rehearsing. And while the Arsenal supporters' club is comprised mainly of 20-something students, Manchester United seem to have a wider variety of devotees. Nikolay Molok, head of the Stella Art Foundation and former editor of Art Chronika magazine, can be found at the bar almost without fail on match nights - often accompanied by his 15-year-old son. "My son Kolya is interested in football, and I wanted to be able to watch games with him in a nice, friendly setting," Molok says. "I wouldn't dream of taking him to Russian matches. When I go to the stadiums, I hear swear words I don't even know. It's not a great place for a young man to be." Ilya Zubko concurs, describing the brutal habit of rival fans organising fights with each other and posting videos on the internet to show who won. 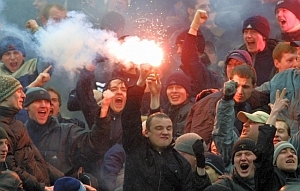 "At the first game of the current season, between Zenit St Petersburg and Spartak Moscow, one group of drunk hooligans started breaking down police barriers and hurling seats across to the other side," he recollects. "However, fighting in stadiums is actually far less common than it once was; the police aren't as aggressive these days. Fans are much more likely to meet somewhere in the forest and fight secretly there." As Western influence gradually pervades the vast expanse of the Russian Federation, opportunities to follow foreign clubs are multiplying. Sports bars are springing up, especially in larger cities, and young people are slowly gravitating towards European cultural norms. It's an emerging market. Manchester United is well known for pouring resources into a far-reaching Asian commercial plan, including a recent pre-season tour of Malaysia, South Korea and China. Is Russia a feasible next step?